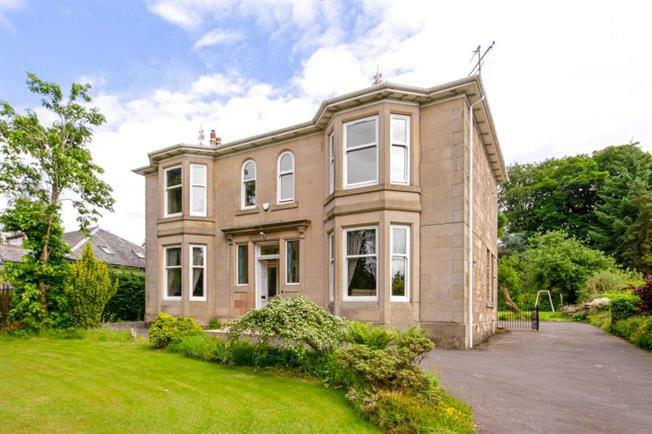 5 Bedroom Detached House For Sale in Glasgow for Offers Over £500,000. An imposing Victorian detached residence occupying a generously proportioned plot of approximately 0.5 acres with mature trees and shrubs providing a high degree of privacy as well creating a lovely environment in what is arguable one of Kirkintilloch's most desirable residential areas. Constructed some 150 years ago, this exceptionally spacious family home boasts a number of original features such as the ornate cornicing which features in a number of the rooms as well as that character and charm from a bygone era. Offering scope and potential for further modernisation and upgrading this impressive home provides spacious living space that can easily be adapted to suit a wide variety of family needs. Complemented by what is undoubtedly one of the largest plots in the area, the property sits back from the road and is well screened by the mature surrounds. Rarely does the opportunity arise to acquire such a combination of house and garden that early appraisal is advised for a full appreciation. The outstanding family accommodation comprises: entrance vestibule, welcoming reception Hall, two impressive front facing public rooms both featuring bay windows, well equipped fitted kitchen, separate utility room, large 5th bedroom, spacious w.c with separate shower room and family room forming the extension to the rear. On the first floor there are four well-proportioned bedrooms and family bathroom with three-piece suite. This excellent home is further enhanced by gas central heating, H shaped driveway and parking leading to detached garage, greenhouse and exceptionally spacious mature landscaped gardens surrounding which enjoy a high degree of privacy. From the garden grounds there is direct access to the Forth & Clyde canal foot path, which would offer great recreational opportunities. Located a short distance along the Kilsyth Road on the right hand side going out of town number, 46 is well placed under a mile from the centre of Kirkintilloch in what can be describe as semi-rural environment, yet is convenient to the local amenities. Kirkintilloch Golf Club is within a mile and a half and Glasgow City Centre is just some eleven mile away by road via the M80. The property is within the catchment area of Lenzie Academy and is within easy access of Lenzie Station.